Echelon Explorations: Polyhedral Pantheons is now available for purchase and download! The worksheets alone are available as a PWYW (DriveThruRPG/RPGNow) or free (Open Gaming Store and Paizo) product. The full version comes with the Polyhedral Pantheons PDF, the worksheets, and the Excel spreadsheet I use when applying the polyhedral process. Several years ago I wrote an article on Polyhedral Pantheon Design. This article predates this blog, so when I imported it from the original site to this one it has basically languished, unread, back in the depths of history. This weekend I updated it and expanded on it. I’m pretty happy with how it turned out. All in all I’m pleased with this series so far. There are still a few posts to come. In fact, I’m working on Echelon Explorations: Polyhedral Pantheons, collecting material from the above posts. I’m also adding some more articles here as I round out the content of the book. Polyhedral Pantheons Book Outline is a draft outline and I’ve already diverged from it… for the better. The deities of the Elemental Tetratheon are clearly divided between the four hermetic elements, and a different nation worships a the deities of each element. In Elemental Tetratheon, First Analysis I started examining the consequences of the design decisions (each face deity has one and only one elemental domain, and one and only one alignment domain). Elemental Tetratheon, The Crunchy Bits has the start of a element-oriented pantheon for a much larger, more sophisticated, and nuanced culture than the jhesiri. Elemental Tetratheon, First Analysis looks into the interactions present in the Elemental Tetratheon. The structure of the domain assignments caused some interesting connections. Earth Deities of the Elemental Tetratheon describes the deities of the Kamen, the latest civilization to flourish (for a time) under the watch of the earth deities. Fire Deities of the Elemental Tetratheon describes the deities of the Sretan, who are fortunate enough to live in warm, arable land and have the leisure for enlightenment. Air Deities of the Elemental Tetratheon describes the deities spawned from Povjetara, The Anguished Wind, who devastated her followers the Ostechen. Water Deities of the Elemental Tetratheon describes deities of the Moraplovas, a vigorous culture of explorers… and of pirates and raiders. In Reviewing the Elemental Tetratheon I went over the results of the development done in the last four articles above, checking for domain/alignment pairings (you can’t find an evil deity among the fire deities, but four of the deities can have evil clerics). I admit to being surprised to find that — except for the alignment domains, which require the cleric to have the same alignment — most domains are available to clerics of most alignments. They might be constrained in their other choices, but if you really want a lawful cleric with the Madness domain, or a good cleric with the Madness domain, you can. You can’t have a lawful good cleric with the Madness domain, though. In Goblin Pantheon Revisited I make some changes… well, I start over but I keep a few of the ideas from the previous iteration. I end up with a much more workable set of deities. Hilljack Deities of the Goblin Pantheon describes the deities of the vorobec, an insular and less nomadic group of goblins. They would rather be left alone, and their deities reflect the actions and activities the vorubec take to ensure this is so. Jhesiri Deities of the Goblin Pantheon replaces the earlier jhesiri deities. There is less — but not no — ‘smashy smashy destroy everything because reasons‘ that I found so dissatisfying the first time around. They are still fully-grounded in destruction, but more nuanced, and in some cases representing unavoidable events rather than deliberate malice. Kouzelnik Deities of the Goblin Pantheon describes the deities of the mad kouzelnik tribe, the mystics who are compelled to seek out ‘jatemst’… even though no one can define it. I revised the original halfling pantheon. I had planned to use it as an easily-recognized (cliché?) example, but just wasn’t feeling anything for it. Perhaps it was ‘too cliché’. I cast about for ideas and ended up setting it in a culture modeled after fantasy medieval China and it came together wonderfully. In Shu-shi Pantheon (Halfling Pantheon Revised) I switch some of the domain assignments around. The domain sets are quite similar, and the previous design guidelines are present (law and good are desirable, chaos is uncanny and unnerving, and Death, Destruction, Evil, Fire, and Magic are Right Out). Twelve Shu-shi Deities describes the Jixiang Shen (the auspicious deities, favored by and believed to favor the Shu-shi) and the Bukeshi Shen (the uncanny deities that make the Shu-shi uncomfortable). Ultimate Shu-shi Deities Post describes the ten remaining Shu-shi deities, the Zhengchang Shen. These deities are neither auspicious nor uncanny, they simply are. I’ve replaced the original run at the goblin pantheon. It was a little too much caricature and all-bad-stuff, a little too far for my taste. The new one (linked above) works better. I’m keeping the old posts as a comparison. Goblin Pantheon, The Crunchy Bits has the start of a mob of deities with nothing good about them. There are three groups of goblins that follow these deities, each following a different set of the mob. Jhesiri God: Ramdzasha, The Five Headed, Feeds on Devastation is the goddess of destruction, and the other deities of the jhesiri are her aspects… physically torn from her body and sent to do her bidding as needed. Jhesiri God: Hadang Samptar, Razing Hunter, Wandering Ravager is the aspect of Ramdzasha that most epitomizes the jhesiri attitude of “kill and destroy and move on to find more to kill and destroy”. Jhesiri God: Natlot, Battlesinger, Lethal Dancer is a surprising ally of Hadang Samptar. Where Hadang Samptar tries to destroy everything, Natlot is more precise in his destruction, being very selective in targets and efficient in approach. Even non-jhesiri assassins and duelists sometimes follow Natlot. 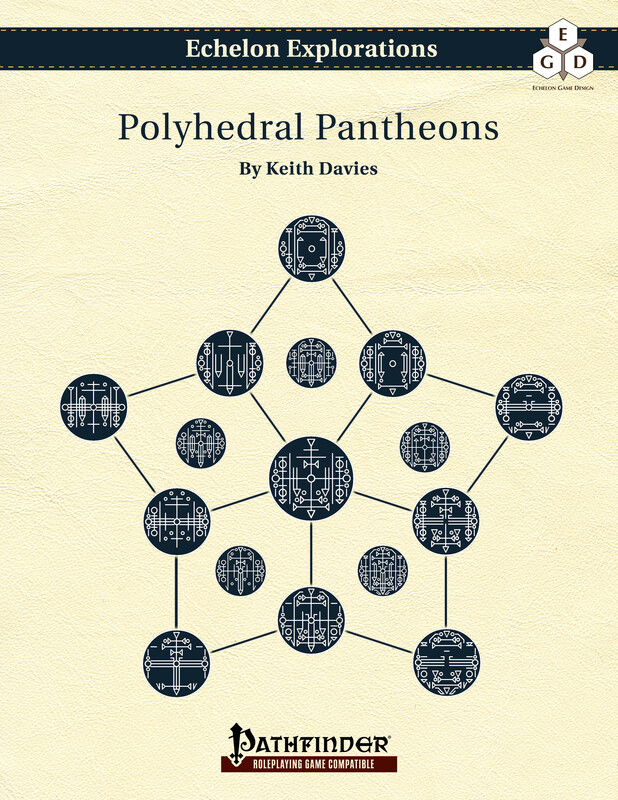 There are even a couple of posts at Sycarion Diversions, where John Payne has developed a small pantheon using the Polyhedral Pantheons methods. A Tight-Knit Pantheon outlines the domain assignment. Tight-Knit Worldbuilding or How I Let Go and Learned to Enjoy the Hexcrawl interprets the results and does some world building around the results of the domain assignments. I’m still working on the Polyhedral Pantheons book. I want to include the deities of the Donnerkonig Chronicle from last year. This is in part because I have a use for them, and to be honest in part because I really like the idea of having a full hundred deities in this book. I’ve also explored how to adapt the techniques used in polyhedral pantheons to other topics. This material is not expected to be included in the Polyhedral Pantheons book, but may find its way into other books. Variations on a Theme: Adapting Polyhedral Pantheons suggests other ways the techniques can be used: Physical Geography, Planar Geography, City Wards, Characters, 13th Age-Style Icons, Megadungeons, and Campaigns. Working on Polyhedral Adaptations fleshes out some of the variations: Physical Geography, Planar Geography, City Wards, and Megadungeons. Characters, 13th Age-Style Icons, and Campaigns were not in scope for this post, each likely being too large and complicated. Examples of Adapted Polyhedral Pantheons shows what it might look like to apply the techniques to Physical Geography (devising the background for a potential campaign setting) and City Wards (that could produce a table used to semi-randomly generate cities in a particular nation or culture). Pingback: Links of the Week: April 16, 2012 | Keith Davies — In My Campaign - Keith's thoughts on RPG design and play. Pingback: Rethinking Pathfinder Cleric Subdomains, Part 1 | Keith Davies — In My Campaign - Keith's thoughts on RPG design and play. Pingback: Polyhedral Pantheons: Sanity Check | Keith Davies — In My Campaign - Keith's thoughts on RPG design and play. Pingback: Building Pantheons | Keith Davies — In My Campaign - Keith's thoughts on RPG design and play. Pingback: A New Polyhedral Pantheon | Keith Davies — In My Campaign - Keith's thoughts on RPG design and play. 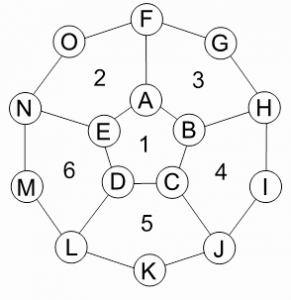 Pingback: Polyhedral Pantheons: Alternate Polyhedrons | Keith Davies — In My Campaign - Keith's thoughts on RPG design and play. Pingback: I Want Some New Gods | Keith Davies — In My Campaign - Keith's thoughts on RPG design and play. Pingback: Polyhedral Pantheons in the Wild: Sycarion Diversions | Keith Davies — In My Campaign - Keith's thoughts on RPG design and play. 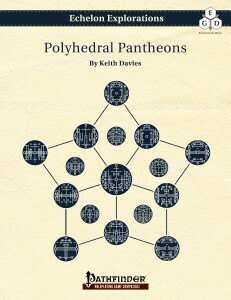 Pingback: Polyhedral Pantheons Book Outline | Keith Davies — In My Campaign - Keith's thoughts on RPG design and play. Pingback: Polyhedral Pantheon: Goblin Pantheon, The Crunchy Bits | Keith Davies — In My Campaign - Keith's thoughts on RPG design and play. Pingback: Goblin Pantheon, The Crunchy Bits | Keith Davies — In My Campaign - Keith's thoughts on RPG design and play. Pingback: Elemental Tetratheon, The Crunchy Bits | Keith Davies — In My Campaign - Keith's thoughts on RPG design and play. Pingback: Earth Deities of the Tetratheon | Keith Davies — In My Campaign - Keith's thoughts on RPG design and play. Pingback: Goblin Pantheon Revisited | Keith Davies — In My Campaign - Keith's thoughts on RPG design and play. Pingback: Icosahedral Pantheons | Keith Davies — In My Campaign - Keith's thoughts on RPG design and play.